Stas Drive - one of the most respected DJs and sound producers of Ukraine. His success is measured not only by the glowing reviews on specialized forums, but also by the high quality of his own tracks on underground electronic dance world scene. He has great musical experience and knowledge in work with the dance floor. Has invested a huge amount of own forces in the development of dance music in Ukraine and Russia. The ideal behind his music - the bright cosmic vibrations for body and Soul. Stas found a special magic hypnotic sound and no surprise that it is one of the most played artists in sets of Hernan Cattaneo, Nick Warren and GuyJ. His releases have been out on labels such as: Crosstown Rebels, Lost&Found, Hope, microCastle, Sudbeat, Plattenbank, Proton, Flow, Lowbit, Replug, Dopamine, Intemporal, Movement, ao.. Besides the aforementioned names his music has received massive support from: Sasha, John Digweed, Guy Gerber, Maceo Plex, Marco Carola, Armin Van Buuren, Dave Seaman, Nick Muir, Anthony Pappa, Edu Imbernon, Stephan Bodzin, Guy Mantzur, Dosem, Henry Saiz, Cid Inc and many other dj's of various levels all over the world. 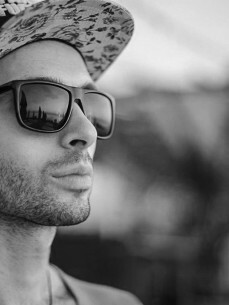 As a DJ, producer, event promoter, participant of Kazantip, and teacher in several DJ schools, in 2006 Stas tries himself in the role of the sound engineer for the first time confronted with sound mechanics. He made a series of bootleg remixes for James Holden - Nothing, Agoria - Baboul hair cuttin, Rennie Foster - Devil's water, Monika Kruse - Fragile and Popof - Non-sense. It's not surprising that in 2011 his talent was noticed one of the best sound engineers in Europe and popular sound producer Henri Hurtig (Cid Inc), who immediately offered to release a Stas on his Replug Records. Thus emerged Salt N Sugar - Fiolent / Maritime EP After this, Stas began to cooperate with Russian techno DJ Denis A and DAR label, as well as with a series of labels Proton Community and Manual Music.